Description: The brilliant coloration, and long flowing fins of the Betta make it one of the most well known of aquarium fish. Colors range from red to blue to white. Females are not as highly colored, and have much shorter fins. A well conditioned breeding female will often display horizontal stripes. Habitat/Care: Bettas are one of the most recognized, most colorful, and often most controversial fish in the freshwater hobby. Debates range on about the appropriateness of keeping them in small bowls. To fully understand their needs it is important to become familiar with their native habitat. Bettas originate in the shallow waters in Thailand (formerly called Siam, hence their name), Indonesia, Malaysia, Vietnam, and parts of China. They proliferate rice paddies, shallow ponds, and even slow moving streams. Although many fish keepers are aware that Bettas come from shallow waters, a key factor that is often overlooked is the water temperature. These countries are tropical, which means the water temperature is quite warm - often reaching into the 80's. Bettas thrive on heat, and will become increasingly listless when the water temperature falls below 75 degrees F. Water temperature is perhaps the biggest argument against keeping a betta in a tiny bowl (which cannot readily be heat controlled). Even though Bettas do well in waters low in dissolved oxygen, that does not mean they require less oxygen than other fish. Bettas have a special respiratory organ that allows them to breath air directly from the surface. In fact they inherently must do so. In experiments where the labyrinth organ was removed, the fish died from suffocation even though the water was saturated with oxygen. For this reason, Bettas must have access to the water surface to breath air directly from the atmosphere. Optimally the water for keeping healthy Bettas should be soft, warm, with a neutral to slightly acidic pH. Water movement should be kept to a minimum, which means that power filters and powerheads are not suitable. Bettas may be kept in a community tank as long as the water conditions are met, and if no aggressive or fin-nipping fish are present. However, only one male may be kept in each aquarium, unless they are separated by a barrier. The use of plastic boxes that hang inside the aquarium are a suitable option for keeping more than one betta in a tank, or for keeping them in a tank with fish that might nip their fins. Females will generally not fight with each other, and may be kept in the same tank. NOTE: Selling a betta in a vase with a Peace Lily has become in vogue. However, a flower vase is not a suitable environment for the betta. For more information check the additional information links to the right. 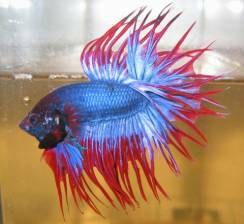 Diet: In nature Bettas subsist almost exclusively on insects and insect larvae. They are built with an upturned mouth that is well suited to snatching any hapless insect that might fall into the water. Internally their digestive system is geared for meat, having a much shorter alimentary track than vegetarian fish. For this reason, live foods are the ideal diet for the betta, however they will adapt to eating flake foods and frozen and freeze dried foods. Brine shrimp, Daphnia, plankton, tubifex, glassworms, and beef heart, are all excellent options that may be found frozen or freeze dried. If flake food is fed, it should be supplemented with frozen and freeze-dried foods, and if possible live foods. Bettas have a fairly short lifespan, and are most successful as breeders when they under a year old (bettas in pet shops are usually at least six months old). They breed in bubblenests and do not require a large tank or special equipment.Most breeders find that a bare bottomed tank of roughly ten gallons works well, although smaller tanks are also suitable.Ideally the fish should be conditioned prior to breeding, by feeding them a diet of live foods. The water should be at a pH of about 7.0, and temperature around 80 or slightly above. The male will blow an elaborate bubble nest when he is ready to spawn. The female should be provided with a hiding place, as males may become aggressive during courtship. Even with a hiding place, it is common for the female to lose a few scales or have their fins frayed during spawning. When they are ready to spawn, the pair will display intense coloration and begin circling each other under the bubblenest. The male will wrap himself around the female who has turned on her back. As she expels the eggs, they are fertilized and begin to sink. The male will scoop up the eggs and spit them into the nest. From this point on the male will tend the brood. It is advisable to remove the female, as the male may become aggressive towards her as he tends his young. The male will continue to tend the bubblenest, spitting eggs that fall out back into the nest. In one to two days the eggs will hatch, and the fry will be visible hanging in the bubblenest with their tails pointing downward. They will feed off their yolk sack for another thirty six hours, during which time the male will continue to pick up any fry that fall out of the nest. The male should be removed within two days after the fry hatch, as they may eat the young once they are free swimming. The fry should be fed a couple of feedings daily of baby brine shrimp or very fine baby food. Tetra makes a dry mixture specifically for egglaying fish, and many pet shops carry frozen baby brine shrimp. Take care not to overfeed, as the uneaten food will foul the water and can quickly prove lethal to the fry. Additional information on breeding, raising fry, and photos can be found in the Additional Information section below.